NAMM 2017: Trace Elliot is packing a lot of punch into a tiny package with its new ELP bass amplifier, promising a "revolutionary" 200-watt mini amp that weighs just 1.6 pounds. Into this tiny footprint - the smallest in the industry according to the firm - the amp-maker has somehow squeezed a three-band EQ, headphone ouput, XLR outputs and an input gain stage that runs through uncompressed, multiband compression and into overdrive (with a red LED to indicating that the compression circuit is active). The current US MSRP is a tempting $399, so with the caveat that the big question - i.e. what does it sound like? - remains unanswered, we could see the ELF on the shelf in a lot of homes and practice spaces in the future. MERIDIAN, MS — Good things come in small packages, and now Trace Elliot® can add "small yet powerful" to that saying with the introduction of the ELF bass amplifier. Weighing just 1.6 pounds, this revolutionary amp is small enough to fit in your back pocket. The ELF's remarkable technology and size make it the most portable, gig-worthy bass amplifier ever made. It's an ideal solution for any bassist who is concerned with size and weight, but isn't willing to compromise on tone or performance. Designed in the U.K. and the U.S., the ELF produces a solid, fan-cooled 200 continuous watts RMS at 4 ohms. The switch mode power supply has thermal as well as over-current protection, and the gain knob features a bicolor LED that turns red when the preamp compressor engages. The unique input gain has three regions of operation - uncompressed, variable multiband compression, and overdrive. In terms of sonic quality, the ELF has a clean signal path with simple controls, making it easy to achieve a professional bass tone. The 3-band rotary EQ has three proprietary Trace Elliot filters: low center (80 Hz), mid center (500 Hz) and high center (4.2 KHz). 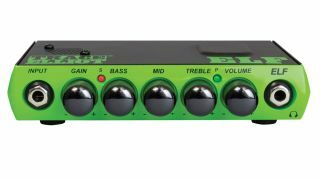 Studio-quality XLR outputs, with a ground lift switch, ensure the tone the player has on stage is the same tone in the PA. There's also a headphone output to enable quiet practice. The ELF provides all of this versatility in a unit that measures a trailblazing 1.35'' by 6.75'' by 4.10''—today the smallest bass amp in the industry. The ELF comes with an embroidered nylon carrying case, an owner's manual CD-ROM that includes the REAPER™ DAW and Peavey® ReValver® amp modeling software, and a Union Jack sticker that reminds of Trace Elliot's U.K. roots. To learn more about Trace Elliot, visit www.TraceElliot.com.